Crew: McClain Smouse, Andy Miller, Eric Miller, John Hotze, Vince Alfaro. Sponsors & Support: Miller Motorsports, Hotze Racing, Carson Body Shop, Macedonia Implement, Kebbsmiles Foundation. 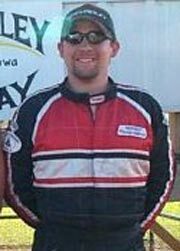 2000 Bobcat Speedway Rookie of the Year, 2nd in 2001 SWIDKS Points, 2003 Blencoe Track Championship, 2003 Hard Charger with 78 Passes, 12 Feature wins, 32 heat wins. Most of my career revolves around Miller Motorsports and Hotze Racing. They have been my mentors. The rest I learned while working in the 90, 9, and 52 pits. 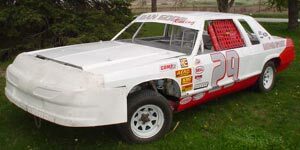 I retired from Kart racing after the 2003 season on top with a Points Championship and I bought a 1980 Ford LTD Hobby Stock. 2004 left much to be desired, with a blown motor in the very first race and not enough time or money to fix it. 2005 wasn't any better. Motor troubles again. And when we finally got it running right, we tore up the car. I'm now retiring until college is done with. Find some more sponsors! Without some serious help from someone out there I am done for a few years. I chose my car number when I started racing because it was the number on my jersey when I played football. This number has special meaning to me now since the death of Dale Earnhardt. Dale was the driver I looked up to and admired when I started racing. After his death when they changed the car number, it made me feel like the number was an omen for me. I will keep it as long as I am racing.